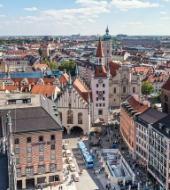 The Grand Circle Tour shows you the highlights of Munich: the Palace of Nymphenburg, the Olympic Grounds as well as the Siegestor near the English Garden on open air double-decker buses which you can hop on and hop off any time you want to. A complete Grand Circle Tour lasts 2.5 hours. Of course, getting on and off adds to the total duration of the tour.